This month marked not only Wimpole Clinic’s 40 years of experience treating hair loss with natural-looking hair transplants, but also a brand new head of hair for one of our key team members, Derek Bailey. Derek is Clinic Manager at the Wimpole Clinic and has supported numerous patients arriving, somewhat nervously and hopefully, for a solution to their hair loss or male pattern balding. He’s then happily seen them out of our clinic doors feeling a new confidence for the years to come. This year, he decided that the time was right to take the plunge himself and book our FUT hair transplant. Like many men over the age of thirty, Derek has been suffering gradual hair loss from the crown of the head. Starting with a receding hair line, Derek’s particular hair loss culminated in the oft-seen ‘horse-shoe’ pattern balding. For us, this was another opportunity to hear first-hand how one of our patients felt having a transformational hair transplant to combat their hair loss, and to share experience with those of you thinking of having a transplant and wondering what to expect. Here is a quick interview with the man himself! Wimpole Clinic: So Derek…let us ask you some questions about your new hair transplant. Derek Bailey: Of course. This is my first one! WC: When did you have your transplant? DB: My procedure took place two weeks ago here in the Wimpole Clinic with Mr. May, on 9 th January 2015 to be exact. Mr. May was of course aware of my plans previously, and we had discussed together what sort of hair transplant would be best for me and what sort of hair shape I was looking to regain. WC: So you knew you wanted a solution to your hair loss? DB: Well, my hair line certainly wasn’t galloping forward! WC: So how was the hair loss procedure? DB: I was really present and excited to begin with but of course later, when the anaesthetic had been done – that was a little pinchy – I was just very relaxed and sleepy even. I don’t remember having lunch, but apparently I did! Then it was all over by about four o’clock. WC: Many of our clients experience swelling, minor scabbing and some soreness during the days following the hair transplant procedure. How did you findthe healing the period? DB: I was actually really surprised that I had so little scabs, I mean, despite having over two thousand grafts, there wasn’t much swelling either. WC: Did you experience pain? DB: The only pain I remember having was a mild pain at the very beginning of the procedure when my surgeon administered the anaesthetic. The scalp is very sensitive, or mine is! And the little needle pricks were a little uncomfortable. After that there was no pain. In the first week after the hair transplant surgery, I just had the feeling like I was wearing a tight pony tail. That’s the only way to describe it. An overall feeling of tightness but no pain. At the one point there was an area which felt a bit like a swollen blocked pore, or a spot, but that went away pretty quickly. 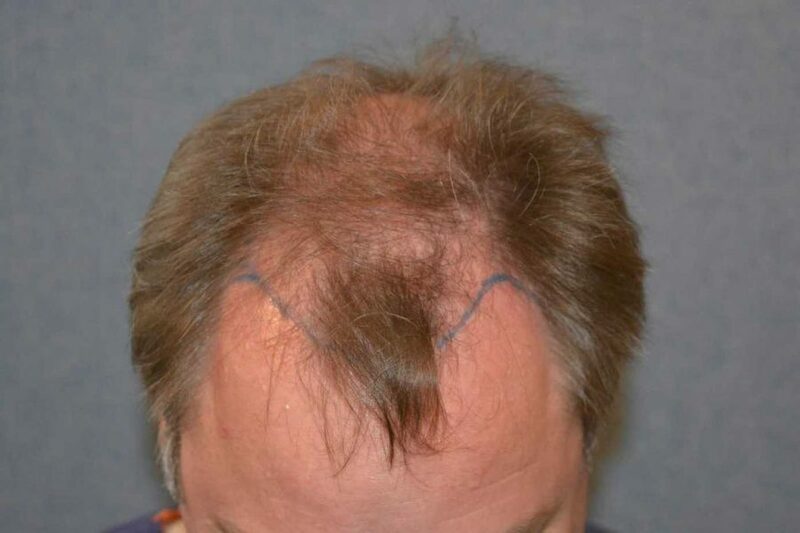 WC: With an FUT hair transplant, a thin scar remains from the surgery. How is the scar doing, and what does it look like? DB: I was aware of the scar for the week afterwards while the skin started to sort itself out and the area was still exposed. Now, the hair is actually growing quite well in the scar so I’m seeing it less and less. I knew that the scar wouldn’t be bad as Mr. May uses a particular kind of stitching – it’s just one stitch really, so no evidence, or very little remains of the surgery. WC: So your hair is growing now? DB: Well, apparently this is unusual, as I knew that the hair growth after a hair transplant takes up to 5 or 6 months, but I’m already seeing some growth. I should be in the hair loss phase! Where the hair initially falls out for new hair growth to occur. I guess there could still be some loss to come! WC: What kind of self-care are you practising to help with the hair restoration? DB: I was advised that gentle massage helps and I’m quite enjoying doing it at the moment. Just with my fingertips, I’m doing little circle motions around the areas to stimulate the healing. WC: Thanks Derek! Can we check in with you in a few weeks time to see how it’s going? Derek wasn’t the only member to have a hair transplant this new year. Our second manager Emilio also had one two weeks before Derek, and next week we’ll be looking at the difference in experience and what other insights he can offer into the procedure of having a hair transplant. If you would like a hair transplant or are considering any solution to your hair loss, we can help. Book a free, no-obligation consultation with our specialist Mr. May today and find out what your options are and how you can move forward. Can Frequent Use of Dyes Contribute to Hair Loss?